This index is divided into sections based on a scripts function. Scrapers: These scripts import eComic information from an internet database. Organizers: These scripts modify eComic information. Managers: These scripts move,rename or delete files based on eComic information. Enhancers: These scripts enhance the native functionality of ComicRack. Comments, suggestions, ideas and criticism of this index can be posted in the Forum Organizing topic or PM'd to me. Description: Adds non-supported files types to the ComicRack library as fileless comics. Includes finding covers for books from openlibrary.org and isbndb.com. Description: A scraper for the italian Publisher AUREA (formerly EURA). Scrapes data from www.aureaeditoriale.it. Description: Imports French comic book information (creators, title, years etc.) from the online French database, Bedetheque. See the guide in the forum topic for more information. 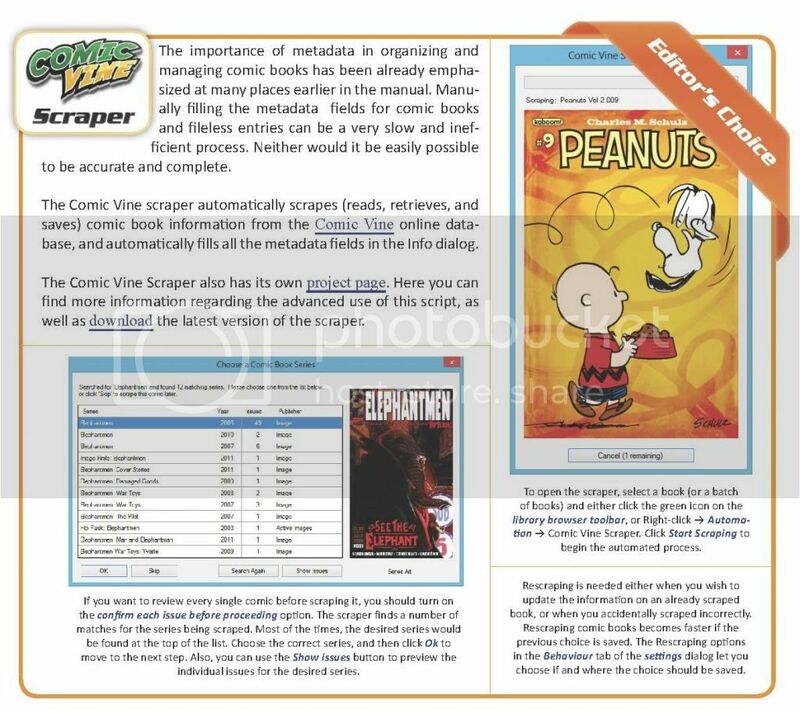 Description: ComicVineScraper is an add-on script for ComicRack that lets users scrape eComic details from the Comic Vine database. These scraped details (story arc, plot summary, publisher, writer, artist, inker, colorer, etc) are added automatically to your eComic files, where they can be saved permanently. Description: Scrapes (read, retrieve and save) data for eComics/fileless from the www.Diabolik.it website, the reference for one of the oldest comic books in Italy. FromDucks - Scrape from I.N.D.U.C.K.S. Extract the .Net 4.0 version into the ComicRack install folder. This script will go out to ComicVine and get read order for books with an Alternate Series. Your books must be scraped with ComicVine plugin for this to work correctly. Don't run it on a huge number of books at once. It is kind of slow and there is no progress bar. Description: Creates fileless comics using a comic's barcode. It searches Google Base for series names, issues numbers and publishers are added automatically from the barcode. Last Edit: 3 years 7 months ago by oraclexview. Description: Contains several scripts for managing new eComic acquisitions and tags. Contains Scanner Tags From Filename, Scan Type from Filename, Save Tags to Notes and Retrieve Tags from Notes. Scanner Tags From Filename tries to find the Scanner name in the filename and saves it to the tag field. There are two variations on this script: one by chaoshunter and one by Stonepaw. Scan Type from Filename tires to import the scan type (c2c, noads etc) from the filename and saves it to the tag field. Save Tags to Notes saves all the tags to the notes field. This is because ComicRack doesn’t save the tags into the ComicInfo.xml file. Retrieve Tags from Notes copies the tags saved into the notes field and put them into the tags field. Auto fill the published month and year of a group of books using a start date and publication frequency. Description: A script that converts a rating on a 10-point scale into ComicRack’s 5-point scale and inserts it into the selected rating field. Description: Copies the first 5 characters from the Series field into Tags, then deletes the first 6 characters from the Series field. Description: Copies for moves information from one field to another. You can either replace or append the information into the destination field. You can also specify text to replace or append into the destination field. Description: Copies the series field to the alternate series field if the alternate series is already empty. Description: Copies whatever is in the series field to the title field. Description: If you are using ComicRack to organize your comic library there is sometimes the need to enter data depending on rules. So you might want to set the series group to Gotham for all Batman books. Or you scraped your data from Comic Vine (using the excellent ComicVine Scraper) and discover that some of the information in the ComicVine database is not correct. 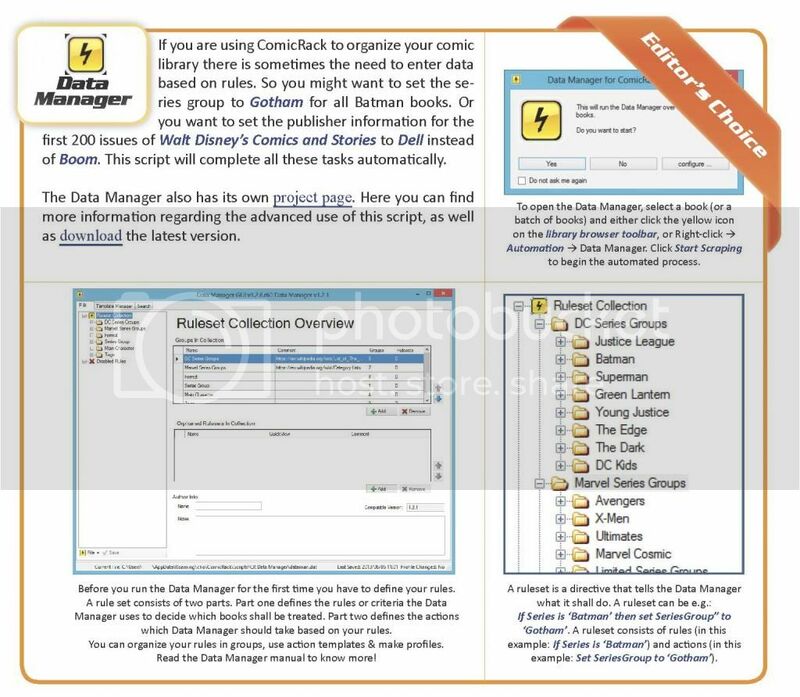 So you want to set the publisher information for the first 200 issues of Walt Disneys Comics and Stories to the correct publisher Dell instead of Boom. This plugin will complete all these tasks automatically. Description: Removes the CRDB tags from the selected eComics. Description: This script will import tags from the existing file names using a regular expression. It will parse the path and file name, but not the extension. It also can save tag patterns for later reuse. Description: Any number of books with similar titles and this script will find the longest common substring and give you the option of setting that as the value for the Story Arc on the selected books. Description: A script that allows you to insert a 5-point rating via the keyboard instead of click on the stars. Split Series Name.py - splits comic's series name into series and title around either "-" or ":"
Join Series+Number+Title.py - useful for comics with a number in the middle of the name. Description: Imports various information from the filenam. Infomration such as: number of pages, scan features, number of covers and comic format. Description: Path Reader and InterActive Tagger. Imports tags from the file name using reguelar expression. Includes a comprehenvise preview to easily tweak the regex and see what will be imported. Description:If the book is an Annual Format with Annual in the name it will remove " Annual" from the series name and optionally adjust the volume by subtracting the number. Description: Imports scanner names from the file name into the Scan Information field. Formated as Scanner:Name. Prefix is now user-definable in 0.4. Last Edit: 5 years 9 months ago by 600WPMPO. Description: Requires ComicZeal for iPad and SyncDocs. This script copies comic into the SyncDocs folder, naming the files for ComicZeal. This simplifies the SyncDocs process. Now also supports FTP. Description: This script is an addon to comicrack that identifies duplicated ecomics and follows a set of user defined rules to remove unwanted dupes. It is designed with the 0-days in mind, but should prove useful in other scenarios. Important! Read the first post in forum topic before using this script. Description: Converts the selected eComic to a fileless entry by deleting the associated comic files. Requires ComicRack 0.9.130 or better. Description: Converts the selected eComic to a fileless entry by deleting the associated comic files. Saves the filepath of the deleted comic to the ISBN. Has a script to restore the file location from the ISBN field. Description: Provides a GUI to easily create a pattern for renaming files based on a comics information. Renames files only and does not create directories. Notes: Requires an old type install. Extract the zip file into the script folder located in the ComicRack installation directory. On Windows Vista and 7 it may require ComicRack to be run in administrative mode. 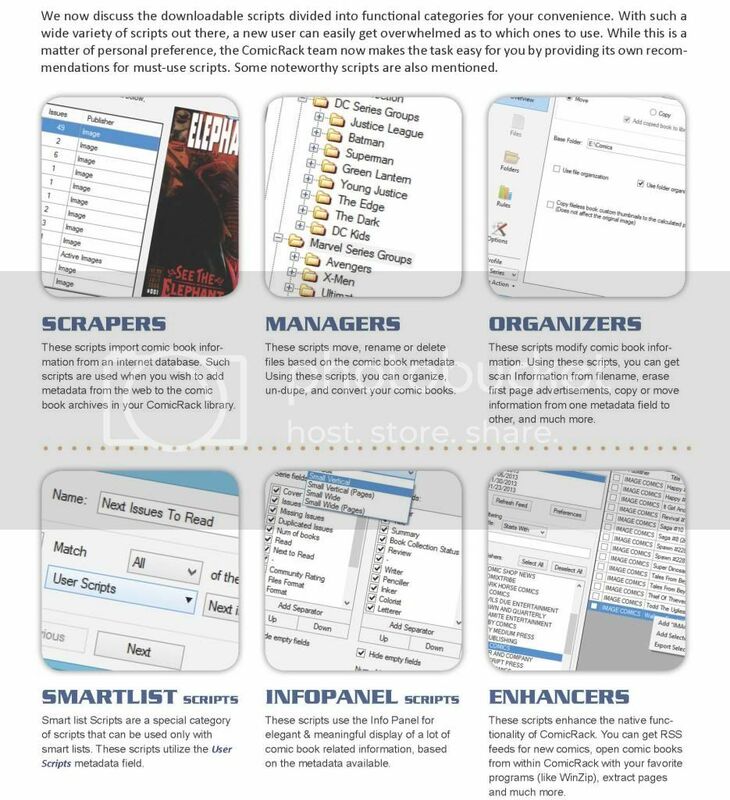 Description: A highly configurable script that organizes your comic files into folders and renames them using a template. Includes an easy to use template creator, exclude rules, move and copy modes, and many other features. Description: Moves a comic file to a different folder from within ComicRack. Notes: Variation by perezmu that uses the volume field as the Beginning Year. Very useful when combined with the ComicVine script. Description: This script renames the book file(s) to a standardize name pattern, creates a new folder structure of [Publisher] \[Imprint] \[Series], move file(s) to new folder and updates ComicRack with the new location. Then remove the previous folder if it is empty. This little plugin automates the process of saving the ComicRack library file. See the manual at google code for further information. Description: The ComicBookInfo Injector takes the ComicInfo.xml inside a CBZ archive and turns into ComicBookInfo style metadata for use with ComicBookLover on OS X and iOS. Required pearl. Read first post in forum. Description: This script creates a script macro that can run several other scripts in sequence. 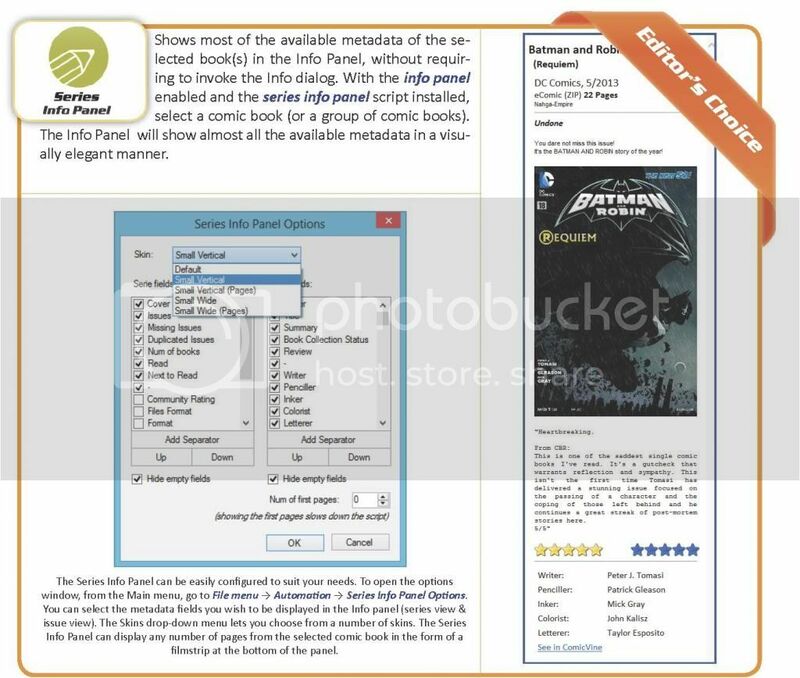 Description: Extracts all the pages of an eComic to a user specified folder. Description: Extracts the first pages of all selected comics to a user selected folder. Description: Finds the missing issues in your library. Requires that you have scrapped your comics with the comic vine scrapper. Description: Runs outside of ComicRack. This script lists all the CRB and CBZ files located in a user selected directory and all its sub-directories. There are two version of this script: one exports the list to a txt file, the other exports to an xls/xlsx file but requires Microsoft Excel. Description: Perl scripts that run outside of ComicRack. 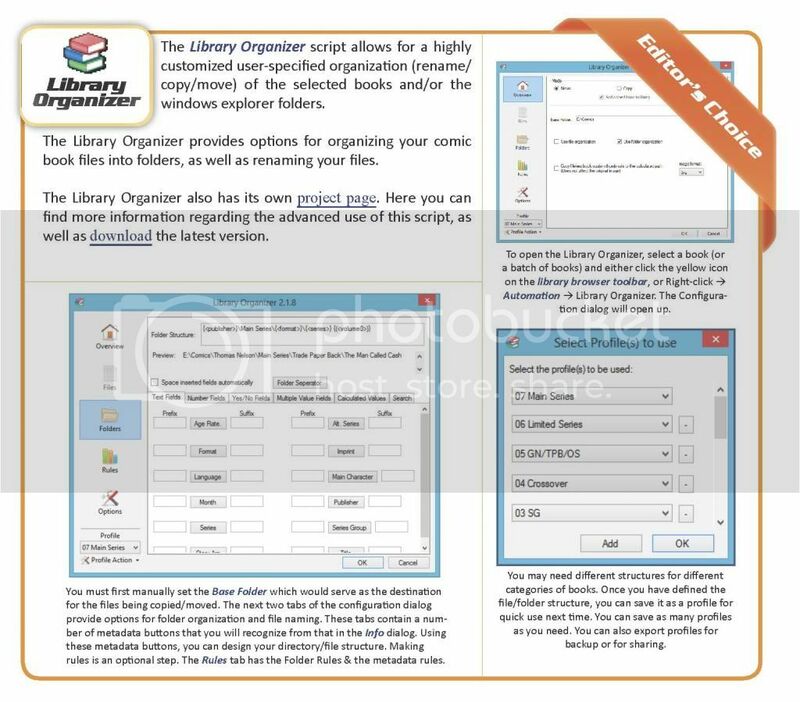 A collection of utilities for managing your eComic collection in windows explorer. Read the forum topic for a list of scripts and how to use. Scans your library for missing issues in series using ComicVine. Runs outside of ComicRack. Read first post in forum thread before using! Description: This script marks the first page as advertisement, the second page as front cover and then moves the first page to the end. Description: This script allows you to extend ComicRack by adding your own "Open With" item to the right click Automation menu. Description: Adds Pull-list to the tags of every book in a list of series when comicrack starts. Includes scripts to easily add to and manage the list of series. Description: This script helps you maintain a reading list of all the books chosen in the Reading club, fortnight after fortnight. Description: Removes all the bookmarks from the selected books. Description: The attached script (in case anyone else needs it), checks if the 1st 2 pages are both marked as "Front Cover", and if so, it marks the 1st one as "Deleted". Description: Marks the first page as advertisement and following page as the front cover. Useful when the scanner credits are the first page. Note: Uninstall old version before installing the newest version. Description: I have created a post-processing script for use with sabnzbd and comictagger, to put ComicRack tags in files. There is a bash script version that works exclusively on Linux and Mac OSX, and a Python script that works on both of those, and Windows as well. This script will allow you to easily read just about any webcomic on the Internet from within ComicRack. Read the entire archive without waiting for each page to load, get automatic updates for new pages, and of course view and manage your webcomics just like any other e-comic. Description: A script that displays a list of about the new comics coming out each week. Includes filtering comics based on title and publisher as well as displaying covers where available. Description: Writes a list of missing issue in a series to a user specified text file. It can be run on the whole library or on specific series and volume. Description: A smartlist script that pulls comics that have any pages marked with the entered type. Description: A simple smartlist script that shows the books where the files are not found on disc. There is a second smartlist to show the ones that the files are found too. Description: A smartlist script that displays the start and end of any gap in a series. It can be run on the entire library or on specific series and volumes. Description: A smartlist script that pulls any comics that have had perezmu’s Save Tags to Notes script run on them. Description: Displays unread or partially read comics where the previous issue in the series has been completely read. Description: Finds eComics that contain proposed values. To filter results to a specific field you can specify: volume, series, count, format, number, title or year. Description: A smartlist script that pulls series based on how many issues a series contains. Description: A smartlist script that pulls series that have both read and unread issues. Description: A proof of concept that displays a coverflow of the selected comics in the info panel. Description: Shows most of the available metadata of the selected eComic. Description: A script that displays the series, the volumes inside a series, the issues, missing issues, duplicated issues and the cover for the first issue found. Version 0.2 added read percentage and templates. Version 0.3 added exemptions for issue numbers and an issue page.